I get so many emails from people, who in attempt to help their kefir grains, will rinse them in cool water. You should NEVER EVER EVER do this. It damages them and rinses off the protective bacteria that makes them thrive. So many times they will either die, or stop reproducing or not make kefir very well after rinsing. Some kefir grains will survive this and be ok, but it still slows them down and damages them and gives me huge amounts of anxiety. The coating of milk around the kefir grains protects them and makes them strong. Think of it this way. It is like walking around naked in a snowstorm. They need this coating to reproduce themselves, and protect themselves, because of the combination of bacteria and yeast they make up the composition of kefir grains. Rinsing them washes this away. If you need to change milks then rinse them in the milk you are changing them too. You really don’t need to rinse them at all, but if you want to rinse them. Rinse them in fresh milk. You can also give them a prebiotic like Prebio Plus which feeds them and makes them stronger and will also make your kefir more creamy especially if it is separating a lot. I am trying not to shout and put this in all caps, because I understand people just don’t realize that this could hurt them. I am slightly over protective of these microorganisms. I am trying to insure that these little kefir grains stay around and thrive. We need them to help us live and thrive. I’ve been labeled the kefir police, and decided I am ok with this. Somebody has to do it. 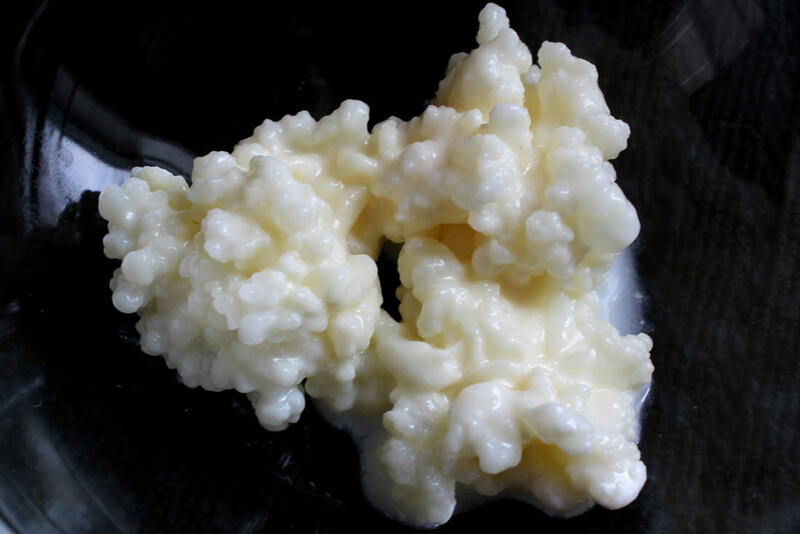 These little kefir grains changed my life, and I will go to great lengths to protect them. Resist the temptation to rinse them and tell your friends Donna said so. I will sleep so much better at night if you do. Tortures me when people tell me they’ve rinsed their kefir grains. 191 Responses to "Don’t Rinse Your Kefir Grains!" I bought some fresh grains about two months ago and have been switching out the milk sometimes on schedule, other times, like this last time, it was left for two weeks. At first the product was very yeasty smelling ( it was too cold in the house too) and didn’t seem consumable, then it got better, but still not what I expected, now i left it for two weeks in the closet, ( ADD) it smelled ok , a bit yeasty again, when draining the milk but i found two fruit fly bodies in the grains. I pressed out the old milk from the grains and picked out the two flies and put the grains in a new batch of room temp milk. Is this ok or should one throw it all out if any fly gets to it? I have yet to drink any kefir after 2 1/2 gallons of milk, but the grains have grown a third more than I had started with. Oh my leaving it for two weeks on the counter can be really hard on the grains if you aren’t feeding it everyday. That will make it really yeasty and could damage the grains. It should be fine if you got rid of the fruit flys but feed it more often as letting it go this long makes it have less probiotics. The grains run out of food. Hi Donna, thanks for all the info on your page and in these comments. My kefir grains are all in one big clump so i just pour it all into a bowl and then use my hand to find it and put it back into the jar. I feel around pretty good for any more clumps but I am worried i might accidentally eat a grain or two some day. Is that ok? Kefir grains are really good for you! No worries they have a lot of health properties. hi there, I have some kefir grains that are taking longer to produce kefir and aren’t really reproducing more grains. It takes twice as long as it used to. But still producing. How can I “recharge” them? You can try adding some Prebio Plus which is food for bacteria but if they aren’t working you might need new ones. If only I’d found this article last night before I rinsed my grains!! I was given milk kefir in partial goat milk which I can’t stand the taste of. Making it with cow milk, batch after batch, didn’t get rid of the goaty smell and flavor… so i rinsed them. Now they don’t seem to be working anymore… no goat smell, but no kefir either 🙁 Do you think they might come back in full after a few batches? I am a couple of weeks into making kefir with your grains and they are working out beautifully. My sister is also making kefir and is new to this as well. I use a clean jar each day, but she is using the same jar over an over again and only washing it once a week. She feels her kefir grains are doing better that way. What is correct. Do you use a clean jar with each new batch or is it okay to use the same jar a few times? Thank you! I don’t wash my jar everyday. I tend to use it a lot before I wash it. This is probably happening because you were rinsing them and it damaged them. Goats milk can get a strong texture sometimes if the milk is not fresh as well. I recently washed the grains in water (so sorry!, first and last time, i promise) because i could taste something off and the grains were getting stringy. Not sure why, i have been changing the milk every 24 – 48 hours. Have I ruined the grains for good, or does their potency increase eventually? Since then i have strained them once, and they looked ok, they rose to the top, smelled the usual way and the milk tasted ok.
Keep making kefir and they can still be okay as long as they make the milk tart and thicken it. I have been making kefir for the past ~8 months. But I got lazy this last time and left the grains in some milk in the refrigerator for the past 1 1/2 weeks. I was going to make another batch and noticed some green growth sitting on top of the liquid in the jar. Can I still use those grains? If its fuzzy or hairy and green it sounds like mold and i would throw it out. I have been very sick and have neglegated many items of which I care deeply, house plants dead; but children well love and provided for their needs. My kefir on the other hand has been in the fridge for over a month. Any suggested streps to save them? Try making kefir and if it sours and thickens it still working. Which is better for someone with really bad Candida overgrowth Kombucha or milk Kefir? I stored my kefir grains in fridge for 4 days by adding 2 cups milk since I was away. After returning I like to make more kefir.I strained my kefir grains and I wonder is the milk part kefir and can I just drink it like kefir and If I want to make more kefir should I just add milk and is the grains as good as new? BTW I love your book. thanks a lot for your lovely site. The milk part is sort of kefir but hasn’t really cultured all the way but is still safe to drink. I started making milk kefir some days ago and I really like it. Last night I had forgotten to buy milk and stored the kefir grains in the frige in a jar of water. And this morming I put them again in fresh milk. Are the grains still ok or I damaged the protective bacteria? You’ll have to make kefir to know for sure. If it sours and is tart it should be ok.
i left my kefir on cabinet to culture for 5 days instead of 48 hours;is that still ok to use for consumption and making for kefir? Yes but longer is not better. 24 hours is the best time. It’s going to be really sour though. Leave them a little longer to ferment would be the best thing to do. I am making milk kefir and use it in smoothies and to make bread. But it is just my husband and I, so one quart last us about 2 weeks. I store the grains in the refrig in whole milk until I am ready to ferment again. Is this ok? I do not want to damage my grains. It takes about 48 hours to ferment a quart…I guess it is because the grains are cold. Yes, it is because they are cold. They get sluggish and you could remove some grins and make a smaller amount more regularly. Hi, I covered my kefir with cheese cloth and fruit flies got into it (dumb mistake). . Are my grains ok to use? Hi there, I would like to start making kefir , where do I start and where I’m can get then from? I put them 3 days in a row in a 32 ounce mason jar and replaced the milk each day. They seem to be doing very well. The problem is by the time the 24 hours is up they are large curds and whey. Does this mean they have no probiotic value anymore? Is the problem that I have to much kefer grains in the mason jar? Should I separate the grains in to 2 mason jars now? HELP! I JUST started doing kefir and I love it!! The sour-er, the better!! I sit them out for about 3 days – my troubled stomach feels so good with this! However, as to my sister’s instruction, upon giving me the grains, I have been rinsing them… in tap water!! … But they’re producing like crazy!! How do I know if I have damaged them from producing all the bacteria strains they had originally? I have, also been adding Vanilla beans and cinnamon sticks in with the new milk and washed grains and am disappointed with the subtle flavor! I was hoping for strong, sour flavors, but like the plain the best! Do I need to add more vanilla beans (using 2 in a quart jar, now), and more than the 3 huge cinnamon sticks for richer flavor? Or do I add them too early? … And should I remove the grains after a day, and exchange for the flavorings… and do what, exactly? Are you adding the vanilla beans during the second ferment? 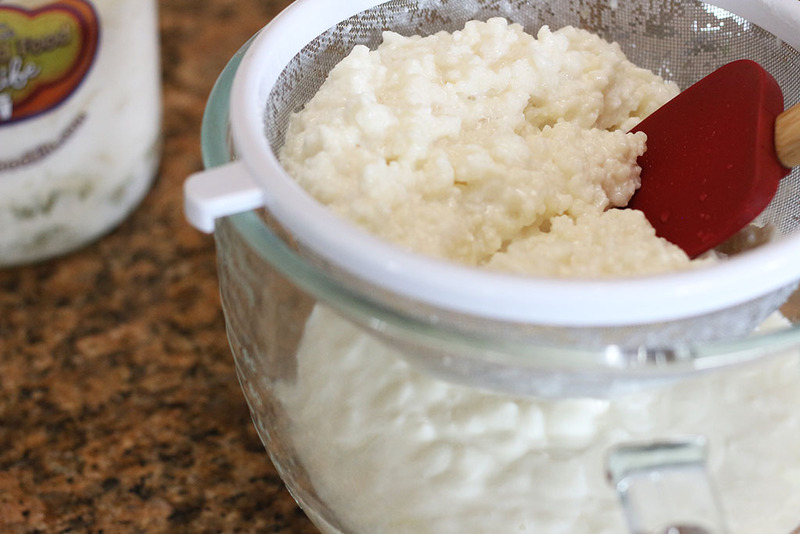 YOu should make the first batch of kefir without the grains and then second ferment the kefir without the grains. Is this what you are doing? I think you meant make the first batch WITH the grains then the 2nd ferment without, right Donna? Hi There, I am new to kefir making, I tried to culture my kefir grains and I left them too long (maybe a day and a half) and they turned into a huge solid clump of curds, I didn’t know how to get the kefir grains out the curds, so I washed them and went through with my fingers to find the kefir grains, do you think I have damaged the grains? I have them culturing in a new batch of organic raw milk now. I am not sure how to tell if they are ready, they seemed to go from looking like regular milk to curds and whey very quickly 🙁 I imagined that the difference would be easy to see. If they are separating into whey and curds they are still working. Just shorten the fermenting time or add more milk. Watch them and catch them before they turn to whey and curds. For some reason my kefir smelled really bad today and looked different then usual (the kefir milk looked really smooth and had a think yogurt like texture) usually my kefir is thick but not so smooth on top in the jar. Is it bad. It sure does not smell like it’s okay to drink. I know you say never rinse grains in water, so can I rinse the grains in milk to clean them and start over. Thanks for your help. oh this is SUCH perfect timing!! I just started making Kefir a few days ago and was told to rinse them with filtered water every day before adding to my organic milk. I was given some grains by a friend and they were fine for 4 months, then one day they were just a big glob of milk, and no grains. What happened? I had extra in my freezer, but the same thing happened when I tried to use them. It’s probably because you froze them in the freezer. This can disintegrate them. I thought you could freeze grains in milk. Is this not true? NO it diminishs the bacteria and is best not too. Oh no! I rinsed my grains… And right after I did it I thought, “uh oh maybe I shouldn’t have done that!” I thought of your website right away and lone behold I made a huge mistake! My grains are very established and I had waaaay too many it was fermenting too fast and I really didn’t want to make such huge batches of kefir. Also I neglected it in the fridge for about a week and it got a little moldy, I was paranoid and rinsed them, threw half out any fed them fresh raw milk, they are sitting on the counter now, do you think they will be okay?? Yes they are probably ok if you only did it once. Make kefir with them and see how they do. I am making kefir with coconut milk. Is it ok to take the grains directly out of the coconut kefir and store them in cows milk between batches? How often do you need to add fresh milk? Yes, you can do this. If you do this once a week this is enough to keep them alive. Hello, I was wondering if you would make an exception and rinse the kefir grains with water when you want to save some of the grains and dry or freeze them? I would never rinse the grains. So, have you ever dried or froze your grains? If so, you just rinsed in milk and then air dried? I ask, because from what I’m reading if you are drying them to have back up, use for later, or send to someone, your suppose to rinse in water before drying them out. Just asking because I want to dry some of mine out because I have such an abundance of grains, I don’t want to ruin them and I really need to dry some out. Thanks so much for your help. I do not do this because it tends to kill some of the strains of bacteria and weakens them and they don’t work as well after that. So I never do it and don’t recommend it. I’ve just started making kefir with cow’s milk, but I would like to try making breast milk kefir for my baby to minimize her dairy intake, should I rinse the grains in this case? To wash away any cow’s milk residue? I wouldn’t rinse them in water but rather milk because the water can kill or harm them. I don’t think you need to rinse them at all. I read the don’t rinse after I rinsed. They have been sitting in milk for 3 days in the refrigerator while I went out of town. They didn’t thicken the milk to kefir. I’m so ashamed. What Can I do? Just had a glass of my first Kombucha, delicious. Try making kefir in some milk on your counter i bet they will be ok. I just rinsed my kefir grains as they looked like creamy cottage cheese and had pale pink spots in them. I have covered them with raw milk in the fridge. I’ve just read your post — LIKE! I am starting this Kefir thing this weekend, but what I want to know is if I make a litre of Kefir milk, and am staring to drink only a few millilitres a day, what do I do with the rest of the litre? Do I just pop a lid on and put it in the fridge and keep drinking my small amount from that same litre? I’d hate to have to throw out so much milk! Obviously whole milk is better, but if I can’t get whole milk, can i use pasteurised milk? Wow! I just received kefir grains and the kefir batches have been getting subsequently worse because I read elsewhere to rinse the grains thoroughly with spring water. Many thanks for this info! I am begining in my learning of probiotic and cultured food. I was recently given a handful of WATER kefir grains that live on a solution of water and pure cane sugar (I think they are called TIBICOUS) and was told that I can’t use them to make MILK kefir. I would like to know if that is true and what would be the difference between water and milk kefir grains. Yes, it is true you cannot use these to make milk kefir. They have different bacteria and yeast specific to water kefir and not milk kefir. Can you and how do you freeze kefir grains? I have to leave for 2 months and will take a small amount with me but want to freeze the rest until I can find a good home for them! No you cannot freeze them it damage them. You will have to find someone to care for them. Hi Donna I love your information and have been a reader of your newsletter for some time. I don’t often disagree with you but this time I do…. Milk kefir grains are ok to freeze. I have done it many times and they re-culture just fine. The bacteria can be killed by heat, as we know, but they survive in the freezer. If someone wants to save the grains by freezing they can doubl;e bag them in a ziplock and freeze for up to 6 months, or rinse the grains, dry the outside, and pack them in a little dried powdered milk, and freeze them for up to a year. I did milk kefir about a year ago and had a beautiful, large clump of grains that I could simply spoon out into the new jar. My new batch of grains is not in a big clump, and I am not excited about sending the kefir through a strainer every day. Is there a way to get the kefir to clump together? You can eventually get a big clump if they are live grains? Mine do this but its the little ones that are more powerful since they are the new ones.